I love Balsamic Marinated Grilled Vegetables in spring, summer and fall. The flavour of summer vegetables from a garden or farmer’s market can’t be beat. Almost any fresh vegetable can be grilled. With a brush of oil and a sprinkling of salt and pepper the true taste of each vegetable shines. But variety to your vegetables and their flavour creates a new experience at the table. This is why I keep a few vegetable marinade recipes on hand. At the beginning of the summer I make a double recipe of my favourite vegetable marinades like this balsamic one. I keep it in the fridge to get me through the summer grilling season in style. Do you have a reusable grilling sheet, or perhaps a few of them? Mine is a Cookina Reusable Grilling Sheet and it works perfectly. You can cut them up, send them with kids to a barbecue and use them on public grills at campsites and parks. The solution to concerns about cross contamination. I wrote a post on the Reusable Grilling Sheet if you want to know a little bit more about these. Try grilling vegetables you have never grilled before for variety. Consider eggplant, artichoke hearts, butternut squash and even lettuce. Sometimes simply serving a different combination of vegetables is a welcome change. I like to skewer small vegetables like mushrooms and cherry tomatoes for two reasons; so they don’t fall through the grill and to combine those that cook in the same amount of time. Whether you use bamboo skewers or typical metal skewers they create an interesting presentation on a platter. Your guests can then mix and match taking only what they like. 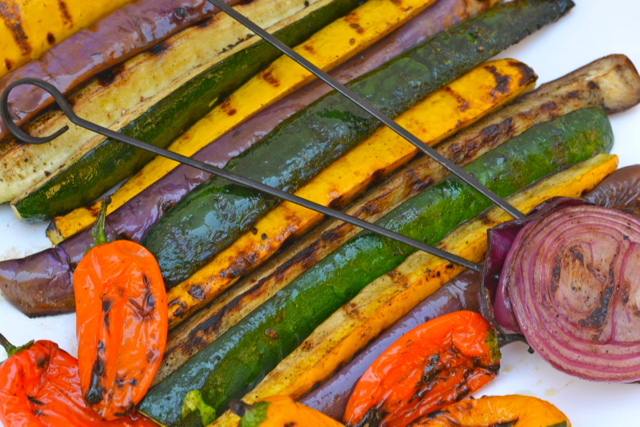 For summer entertaining balsamic marinated grilled vegetables are perfect. Even with no marinade you can elevate the flavours and adds some kick to your vegetables by serving them with homemade chipotle mayo. I especially love this mayo on grilled zucchini, peppers and potatoes; simple and delicious. Marinating vegetables definitely adds dimension to the taste but advance planning is not realistic for an everyday meal. On these nights I brush or pour the marinade on only minutes before the vegetables hit the grill. I enjoy the extra flavour and that works for me. When I’m having company I make the extra effort and honour the recipe suggestion to marinate the vegetables. 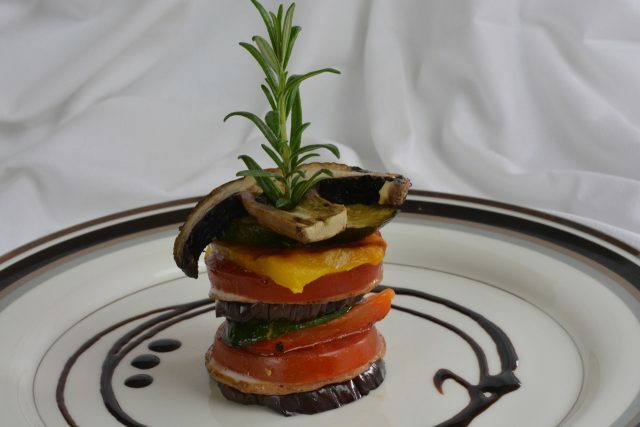 Sometimes I even go all out and make something like these Vegetable Stacks. They are impressive can even be fun to assemble if you have a like-minded guest to help. Summer grilling seems less format but for me presentation always matters. Let me know in the comments below what your favourite vegetables are for grilling or how you present them. Combine all marinade ingredients in a jar, shake and pour over vegetables. Marinate 1-4 hours. Sprinkle salt and pepper directly onto the vegetables before grilling. 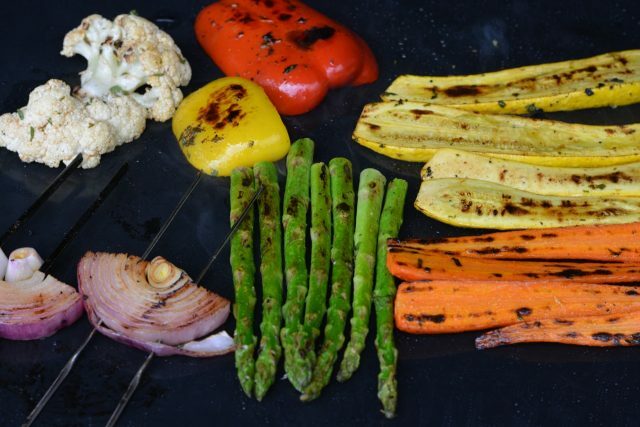 Grill vegetables to desired doneness. * Start with harder vegetables such as peppers, onions, corn and partially cooked potatoes. Toward the end of their cooking time add softer vegetables like summer squash, mushrooms, tomatoes and asparagus. Cook everything to your liking trying to time it so they come off the grill at the same time.